In this article we look at rules, habits and equipment that can make your pool a safer place for everyone. Of course, we all normally think of a pool as a place for fun and relaxation but it is also a potentially dangerous place. Wherever there is water there is the danger of someone getting into difficulties and even the risk of drowning. If you set some rules and guidelines for using the pool and equip it with some basic safety equipment then accidents will be minimised and any incidents are more likely to be resolved without anyone coming to serious harm. The guidelines you set should determine who can use the pool and when, as well as what behaviour is acceptable and what isn’t. Children should never, ever be allowed to use the pool or be near it without being supervised. Pool covers and fences add an additional layer of protection but must never be a substitute for a watchful adult. Adults need to have rules too. Alcohol and pools do not mix. The idea of a midnight swim after a party is a particularly bad one. Running and pushing around the edge of the pool should not be allowed and no one should be allowed to dive into the pool in a reckless or un-safe way. Learn to guard a life. Ideally everyone who uses the pool should have had some basic water safety training and been taught basic rescue methods. Swimming teachers, swimming clubs, surf lifesaving clubs and council leisure facilities are all places and people who may offer coaching in water safety and rescue. Ideally, at least some of the people who regularly use your pool should have been taught how to help a swimmer in difficulties, CPR, rescue breathing and first aid. Safety equipment for your pool. Having some basic rescue equipment in clear view by your pool can make a huge difference to your ability to respond to an emergency situation. The most common lifesaving aid to find by a pool is a ring buoy. A floating ring with distinctive red and white markings that has a rope around it and is attached to a cord which is at least as long as half the pool width at its widest point. The ring buoy can be thrown to a bather in distress as a floatation aid and the rope can be used to pull them gently into the side. The rescue tube is a similar device but in the form of a flexible, vinyl-coated foam tube. A rescue hook can extend over 12 feet and can be used to draw a distressed bather into the side of the pool or bring an unconscious person up to the surface. You may look at the above list and think that if there were to be a situation then the best thing to do would be simply to dive in and save the other person. A very understandable feeling but, even trained lifeguards know how hard it can be to save a swimmer in distress. Their natural instinct is to struggle and it’s all too easy to move to a situation where you now have two bathers in difficulties. Rescue from the poolside should always be the first option. Not everyone who uses your pool will be a swimmer. Adults and children who don’t know how to swim should not be allowed in or near the pool un-supervised. Non-swimming children and adults should be kept in the shallow end and a floating line drawn across the pool where it begins to deepen. Pool depths should be clearly marked on the pool wall or on the decking beside the pool. Diving should not be allowed in any pool that does not meet SPATA safety guidelines. The guidelines define a ‘cage of safety’ in the volume of the pool that is not only concerned with depth but also how far that depth extends from the end of the pool, because many diving accidents occur when the diver hits the slope between the deep and shallow end. Swimming is fun and swimming pools are fun. Very few accidents happen but of course we would like none to occur. Sensible precautions keep people safe, just like everyone wearing their seat belt in the car. We hope that this article has been of use to you and has shown you how a few simple guidelines can make your pool a safer place for everyone. 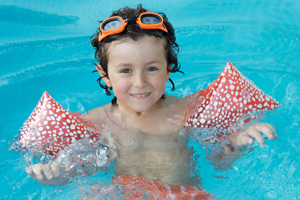 We can help you find your nearest supplier of pool safety equipment and to get that process started just use the contact button at the top right of this article. If there is anything you would like to add to this article or if you would like to leave a comment then please just use the reply box below. Swimming pool chemicals and safety.